Floatron Operating instructions are very comprehensive. Many after sales queries can be answered by reading the instructions. 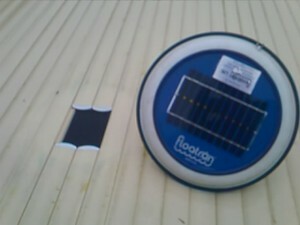 Inspect the solar panel for any visual damage or imperfections which may have occurred during shipping. If any discrepancies are noticed, contact us immediately on receipt. Lay the unit face down on a smooth surface. With one hand, hold the spring electrode down in a compressed condition to allow unobstructed access for the mineral electrode installation. Engage (clockwise) the threaded end of the mineral electrode onto the silver coloured metal screw / stud at the centre of the unit, which is also at the centre of the spring electrode. 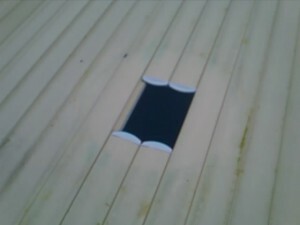 Tighten snugly by hand, about a quarter turn after making contact with the black rubber seal at the base. Place screen cage assembly over the electrodes and centre the hole in the cage with the bore in the mineral electrode end. Attach screen to electrode with thumb screw. The spring electrode is permanently installed and is not removable. Do not attempt removal by twisting or pulling. Permanent deformation may result. Save your original box and inserts for safe and convenient storage during the off season. The purpose of the screen cage is to trap any deposits or residues which form on the electrodes during normal operation. The screen prevents any particles from falling into the water. Your floatron is now ready for the water, but your water may not be ready for the floatron. Read on. The floatron will protect your pool against microorganism invasion. Its solar ionisation process transforms your water into biologically healthy and algae resistant mineral water. Depending on the volume of water, weather conditions, and usage, the initialisation period will range from about a week to several weeks. The floatron cannot ionise a pool instantly because it is designed as a trickle charger with a safe and effective low power output. Therefore, it is important to maintain a normal sanitiser level during this initialisation period until the ion concentration reaches a protective level. Begin with normally chlorinated water, and normal pH for your pool. Use your regular chlorine test kit to maintain approximately 1.0 ppm (Parts Per Million) chlorine residual. More chlorine may be necessary if conditions warrant. Clear the water prior to floating your floatron. If your water is less than clear, it may require a ‘shock’ dose of oxidiser / chlorine. Check for presence of copper ions in the water with the ion test kit. See ‘Ion testing’ . The typical reading at this point is zero to trace amount (0.0 – 0.1 ppm). If higher concentrations are detected, this is usually caused by the previous addition of a copper based algaecide, if so, manage as outlined under ‘Ion testing’ chapter. Free float while ensuring direct sunlight on the unit. If necessary, tether in a sunny part of the pool any suitable restraint may be tied to the tethering chain for this purpose. Operate pump and filter system during daylight hours when your floatron is generating ions. This will allow proper mixing and circulation of the minerals. Pump operation is unnecessary and optional at night, and the unit can be left in the pool overnight. 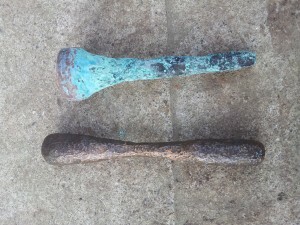 The mineral electrode is made of a unique alloy of several specific metals, predominantly copper. The ion test kit detects the presence of the copper ions, thereby enabling you to determine if the water has an adequate level of protective minerals. The reagents in the kit are very sensitive, and readings can be affected by various interferences. Accordingly, use the ion test as a basic and general indicator. Test only once a week; more often is unnecessary (we advise keeping the test kit in the fridge). Read ion test kit instructions on the test kit. Weekly checks should show an increasing concentration over time. The target is 0.3 ppm, which upon reaching, chlorine reduction may begin. If the ion reading climbs to 0.5 ppm or more, remove the unit from the water for a week and monitor ion level (weekly). Once the level drops to 0.3 ppm or less, resume floating the unit and continue weekly ion checks. If the ion level maintains at 0.3 ppm, then continue floating full time. The purpose of ion testing is to initially determine that it is safe to reduce chlorine, and subsequently to establish a floating schedule which results in a steady ion reading of approximately 0.3 ppm. Depending on conditions, pools with 20,000 gallons (91 cubic metres) or more usually require full time floating. Smaller pools will usually maintain an adequate ion level with a part time floating schedule. For example, one day in, one day out, two days in, one day out, one week in, one week out, etc. Pools with screened enclosures will probably require full time floating as the output will be about half of that with normal full sun. During this period you should witness the ion level build up to approximately 0.3 ppm. Float the unit daily and do not reduce the floating schedule unless the ion level tends to climb too high. Remember, more ions are not better. The water has a capacity to hold only a certain amount of minerals, and attempting to exceed what is known as ‘saturation point’ may result in minerals collecting on pool surfaces. It is important to spend a few minutes a week to check the ion level and to keep the electrodes clean (see ‘Electrode cleaning‘). Upon reaching the recommended ion level of 0.3 PPM, start chlorine reduction by allowing the chlorine concentration to drop to about half of its normal level, or approximately 0.5 ppm. The pH range may now be expanded from 7.2 – 7.8. The floatron works well at higher pH values, so do not adjust the pH if it is within this recommended range. Keep in mind that the general idea is to use your floatron just enough to maintain an adequate ion level, and to determine how little chlorine is necessary to keep the water clear. Allow the water to settle down and seek its own balanced condition. Remove the thumb screw and screen. Blast with a jet of water from garden hose nozzle, from different directions, to knock off loose material and scale. 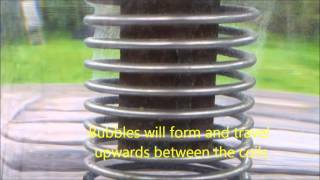 With water running over the electrodes, slide the spring up and down, while making contact with the centre electrode from various directions. The residues will wash away with the water. The centre electrode need not be cleaned down to bare metal, although the spring is relatively easy to clean completely. If the majority of the scale is removed, the floatron will perform satisfactorily. It is not possible to clean the electrodes too much or too often. The cleaner the electrodes, the more efficient the operation. Immerse screen in a jar dilute acid i.e. pH minus or vinegar until visually free of blue/white scale build-up. The dilute acid dip can also be used to clean the electrodes. Place the unit on top of the jar with the electrodes immersed, and remove when the bubbling action ceases. Do not leave electrodes submerged for more than a few minutes. Rinse and reinstall screen. It is important to spend a few minutes a week to monitor the water balance, clean the unit, and to learn the trends. After a couple of months of experience, you should have a good idea about how little chlorine or oxidiser, is required, how much floating time does the job, the best way and frequency to clean the electrodes, etc. The floatron works well with chlorine and most other oxidisers, i.e. bromine, and salt water systems, but it is not compatible with Copper based algaecides, Baquacil or Softswim products. Conditioners, clarifies, etc. are unnecessary. Higher chlorine levels may be required with an increase in water temperature, increased swimmer load, rainfall, or new water added. If using liquid chlorine, add at or after sundown because the sun’s rays quickly neutralise chlorine. The recommended levels are not absolute and may vary with changing water conditions. What works best for your pool is determined by experience. Allow your water to seek its own balance. Do not arbitrarily alter the pH, apply large doses of chlorine (AKA ‘Shock’), add algaecide, add conditioner, or try to change perfectly clear water. Give your pool water time to stabilise, and remember, simplicity is the key. The mineral electrode is sacrificial and designed to slowly disintegrate. After an average of 12 – 24 months, depending on conditions, the electrode will wear away and require replacement. You will know this when it is ‘pencil thin’ , or about 1/4 inch (< 1cm) at its thinnest point. Remove screen assembly and clean parts. While compressing spring electrode with one hand, rotate centre electrode counterclockwise. If necessary, use pliers for advantage. Continue to unthread until free. The procedure for installing the electrode is in reverse order, and can be found under‘Initial assembly‘ .. Ensure ion reading 0.3 to 0.5 ppm. The mineralised water will protect against algae; the ions act as an algaecide, therefore no need to add additional algaecide. Turn off all equipment, including pumps, chlorinators, etc. If the water is clear, no need to oxidise. If less than clear, add chlorine / oxidiser until cleared. Drain water, winterise pumps, cover, etc. as desired. Clean and remove electrode from the unit and store in an airtight plastic bag or jar. Store your floatron indoors. Avoid freezing. Top up water level, backwash, and vacuum. If water is cloudy, add enough oxidiser (chlorine) to clear. Test ion level. Float unit to re-establish 0.3 ppm. Temporarily increase oxidiser until protective ion level is attained. Be sure to maintain enough oxidiser to ensure water clarity. Verify pH is within 7.2 – 7.8 Range. Correct if necessary. If the pool was previously shut down with an insufficient ion level, or severe conditions were encountered late in the off season, less than clear water conditions may be experienced upon reopening. Fill a clear, glass or plastic, jar or equivalent with pool or tap water. Clean electrodes and leave screen off. Place the floatron on the top of the jar, resting on the lip, with the electrodes immersed in the water. With a full sun shining on the solar panel, very fine bubbles will be observed after a few seconds originating from the spring coils. This demonstrates that electrical current is being generated. Absence of bubbles indicates a problem. Read the instructions a couple of times to start. Allow new plaster type finishes to cure for a month prior to using the floatron. Baking soda works well to raise pH, and is readily available and reasonably priced. Household bleach works excellently for small and medium sized pools. For large pools, too many gallons may be required, making more concentrated forms of chlorine more convenient. Keep a tablet of chlorine in the skimmer, or floating dispenser, to provide a constant input of oxidiser into the pool. When necessary, add an additional boost to maintain clear water. Use kitchen cleaner to clean the white plastic floater. Store chlorine in a cool and dark place. Keep ion test kit in refrigerator. Check level of total dissolved solids (TDS) in the water at your local pool store. Readings of approximately 2000 PPM or greater indicate the need to drain and refill with fresh water. If that is not possible, partial draining and refilling is beneficial. With a high TDS, the water cannot absorb and retain minerals very easily, nor can oxidisers be very effective – it is simply too hard. The addition of cyanuric acid (stabiliser) is not necessary if you already use a stabilised form of chlorine, such as tablets. 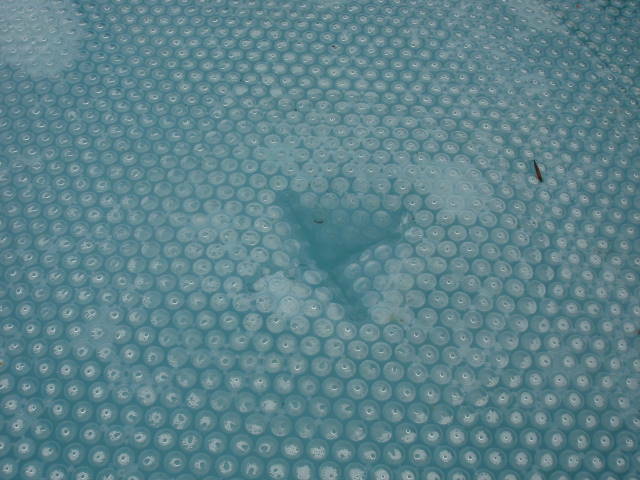 The floatron works well with a pool cover. The choices are to open the cover enough to float the unit, or cut a 3 inch (7cm) “X” into the cover which allows the electrodes to remain in the water while the top is exposed to the sun. Clear, high quality water without algae, and an abnormally low ion reading, does not necessarily indicate that your floatron is not functioning properly, in this situation, test the ion level of backwash water if possible and contact us. When replacing the mineral electrode, ensure that the threads are dry and free of water or corrosion – adding a little Vaseline at each end makes unscrewing the electrode easier. 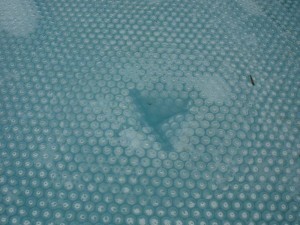 In hard water conditions, over time, the solar panel may form calcium deposits which are left by water evaporation. To quickly and easily remove the scale, apply diluted acid / water (as described under ‘Electrode cleaning‘ ) with a toothbrush. Allow to dissolve deposits and rinse. Vinegar may be used although more time will be required to do the job. The mineral electrode residues have been found to benefit vegetative growth. By cleaning your unit in the vicinity of plants, bushes, trees etc, enhanced growth rates and plant size can be realized. As with any fertiliser, do not over apply, or do not clean in one particular spot for too long. Move around the garden for weekly cleaning. Wearing rubber gloves to clean the electrode, prevents copper deposits staining you fingernails. Do not automatically take advice for granted from those who are not experienced with the floatron. This type of expert opinion is often influenced by the desire to sell or use chlorine and related pool chemicals, additionally, recommendations more often than not reflect a chlorine based pool chemistry, and are not applicable to ionised water. Do not add any clarifiers or metal removers which will eliminate the beneficial mineral ions generated by your floatron. Do not use with Baquacil or Soft Swim brand products, or others with similar chemistry. These chemicals must be removed from the water first. Contact us for directions how to do this. Addition of algaecide is unnecessary as the floatron is an algaecide generator. ‘Shocking’ ionised mineral water is poor technique. It’s like an atomic bomb to the water. The water should be finessed. Oxidiser should be added at reduced dosages to clarify cloudy water. When using the ion test kit, be sure to sight through the sampling tube from top to bottom for colour comparison, not through the side. A low reading will result if viewed through the side. Please download and follow Floatron Operating instructions for ponds to prevent any risk to your fish. The floatron solar powered water purifier not only provides superior pool water quality, it can be used successfully in many non swimming pool situations to keep your water clear and healthy. Algae control has proven to be a real problem for applications with fish in the water. Accordingly, use of algaecides, chemicals, etc are not desirable and will usually result in a fish kill. This leaves the floatron as a unique solution, able to do the job, and in a simple, non toxic, and cost effective way. 1) The body of the water must have a recirculating pump system. 2) The water must be captive, i.e. no inflow or outflow of new water. 3) Total capacity should be approx 25,000 imperial gallons (113,000 litres) or less. 4) Sunlight must directly illuminate the solar panel. Because the floatron is a trickle charger, instant results should not be expected. As with any sizeable body of water, quick and fast changes are to be avoided; slow, deliberate, and longer lasting changes will prove to be advantageous and result in higher quality over the long term. The floatron can do an outstanding job, but you must allow time to do it. If possible, start with a cleaned out enclosure, with new water. It is better to prevent algae, than to eliminate exisiting algae. 1) Float the unit in sunlight, preferably near the pump inlet or outlet. Tether as necessary. This will ensure adequate mineral ion mixing with the complete water volume. 2) Initially, float the unit constantly, and clean the electrodes once a week. 3) When algae begins to die off and turn brown, remove the floatron. If the water is clear enough, the ion test kit which compares colouts can be used to establish an ion level of 0.2 – 0.3 ppm approx. If starting with new water and without existing algae, use the test kit to determine ion level and floating time. 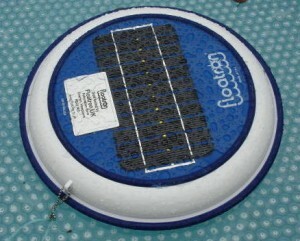 4) Keep the floatron out of the water until algae appears to regain growth. At that point, re-float the unit until brown/ dead algae reappears. 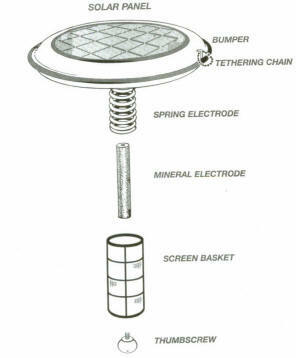 5) Use of the screen is not recommended in ponds – simply use the screw and washer to separate the spring electrode from the mineral electrode. The objective is to float the unit as little as possible to achieve the desired results. Please note that large bodies of water will require full time floating, while in smaller systems the unit should only be floated part time. Environmental factors such as cloudiness, rain, temperature, etc will affect floating time. If some algae is preferred instead of complete obliteration, float just enough to maintain the desired balance. For very small ponds, we advise following the Indoor Hot tub instructions (1 & 2 only) below. 1) Float the floatron on a sunny day for an afternoon. 2) Run the pump now and then. If there is low volume circulation this may be left running during mineralisation. 3) As soon as the level of 0.3 – 0.5ppm copper is shown on the test kit provided remove the floatron. 4) Once the level is established test every two weeks and re-mineralise as required. 5) After using the hot tub pour a few splashes of bleach into the water and run the pump for a minute. By the time the tub is used again the chlorine (bleach) will be gone. 1) Float the floatron in a bucket of water in good sunlight for 10 – 15 minutes. Add this mineralised water to the tub. Repeat until the copper level reading is 0.3 – 0.5ppm. 2) Once the level is established test every two weeks and re-mineralise as required. 3) After using the hot tub pour a few splashes of bleach into the water and run the pump for a minute. By the time the tub is used again the chlorine (bleach) will be gone. We advise re-reading the floatron operating instructions, if ever you have a query, they usually help!